Yet it’s also true that if you feel isolated and lonely over longer periods, it can lead to anxiety or depression, along with erosion of your confidence and self-esteem. Yet all of these issues can be overcome. Whether you want to make new friends, keep in touch with old ones, or feel a part of a group of like-minded people, there are many ways to become more active, engaged and connected in your community once you’ve retired. Here are a few of the ideas we’ve put together, based on the conversations we’ve had with our Renaissance residents. The first place to look for connections is to find out what’s available in your immediate area. Of course if you’re living in a retirement village, there should be plenty to keep you occupied: regular events, social outings, craft groups, sports activities and exercise groups are commonplace in good retirement villages. In the wider community, why not try contacting the library, community centre, seniors clubs and University of the Third Age (U3A) to find out what’s available? Charity organisations are always looking for volunteers and will welcome you with open arms. Meals on Wheels, charity shops, and tourist information centres all have volunteer programs. If there is a volunteer organisation in your community, let them know your skills and experience and they will match you with charities in need of your help. Clubs such as Rotary, Lions, Apex, Zonta, or Quota can be a great way to build relationships with people in your community, while you offer your service to projects both locally and globally. Step up to join the committee and you’ll find yourself busier than before you retired! Taking a class where you learn a new skill is a great way to forge friendships in retirement. Wherever you choose to live in retirement, there will most likely be someone close by running a class in what you want to learn – or something you never even considered before! Either way, you’re sure to build new social connections. Meeting with people who share a common interest can lead to a wonderful sense of belonging while broadening your friendship base. Explore what’s available locally – you might find a book club, photography group, dance club, film society or fishing club. Craft circles also bring creative people together, often to make goods for those in need. If you tend to travel alone – or not at all – why not think about joining a group tour? There are travel companies that specialise in group tours for seniors. Choose a destination that takes your fancy and be prepared for a memorable experience while you make lifelong friends. Nowadays it’s easier than ever to stay in touch with family and friends via the internet. Your retirement village or local library may run classes that teach you how to send emails, see what people are up to through Facebook, or make video calls through Skype. They’ll also provide the equipment so you won’t need to buy anything. You may even be able to access all these services on your smartphone! Bowling, golf, croquet, tennis, swimming – any opportunity to move your body will benefit your health as well as get you out meeting people. Walking groups are often run through chemists, physiotherapists, or even your local GP. Most retirement villages offer a range of activities to keep you active and nearby clubs can broaden your friendship base as well. Some childcare centres offer programs that encourage connection between children and older people in the community. Each generation can offer the other so much – and spending a few hours a week with children is sure to keep you feeling young! If you live close enough to a large hospital, ask if they run a cuddles program for premature babies. This can be a tremendous support for parents and staff, and there’s nothing like cradling a newborn to give you the most beautiful feeling of connection. Men’s sheds are popping up everywhere, providing a place for good old-fashioned mateship to grow whilst keeping your mind and your hands active. And women have many groups to choose from, including the CWA, Inner Wheel, Zonta, Quota and Lioness. Music brings people together in a beautiful way. Choirs are extremely popular with retirees and ukulele groups are the latest to take over in seniors’ circles. Do some research and see what’s available in your area. Whether it’s singing or playing an instrument (or both) you’ll come away from a session feeling on top of the world! Yoga, tai chi and Qigong classes all offer a way to relax your mind and stretch your body. You’ll also find a little escape from the worries of the world through meditation. As an added bonus, most classes offer an opportunity to connect with people afterwards. There’s no doubt about it, the phone just doesn’t ring as much as it used to. People are busy with their lives and far more likely to reach out on the internet. Yet that doesn’t mean you can’t pick up the phone yourself and call people for a chat! Perhaps set up a schedule in advance so people are expecting your call. It will also give you something to look forward to if you know who you’ll be chatting with throughout the week. Today the art of letter writing has long been surpassed by emails and text messages. But that doesn’t mean you can’t find someone who would love to communicate with you via letters. Just write and ask! You might rekindle a friendship through the exchange of letters. Find out in your community groups if there is a pen-pal program for seniors. If not, start one! Good old fashioned potluck dinners (where everyone brings a plate to share) or even a tea party will bring people together. Hold theme nights, play cards or games, or have recipe parties where guests bring a dish using a particular ingredient. Take turns so everyone gets to share the responsibility and pleasure of hosting. You don’t have to wait to be contacted – find out who else may be feeling lonely and reach out to them. It could be reading to the elderly in a nursing home, chatting with someone who has a disability, or just stopping to find out more about that person who works alone in the corner store. It takes just a little time and effort to find your people, to discover where you best fit in, and to feel connected once again. Be patient. Before you know it, you will have shed your loneliness and be living a more rich and fulfilling retirement lifestyle. At Renaissance we’ve been helping our residents to build connections for many years. You’ll have the opportunity to make lifelong friends through special interest groups, sporting activities, social events and travel adventures. To see our facilities for yourself, book your personal tour of Renaissance today. 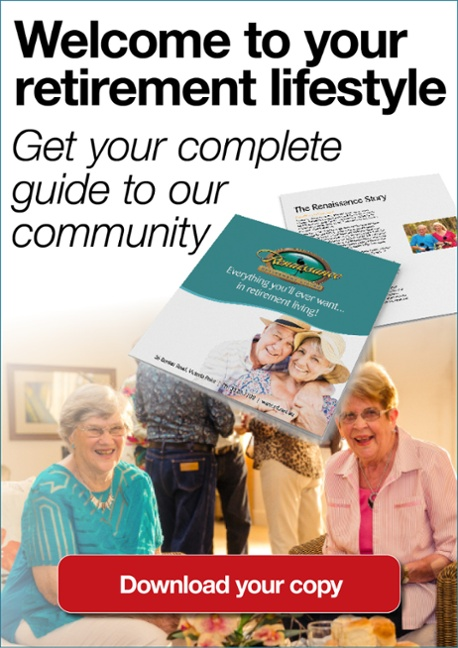 Call Renaissance today on (07) 3820 7700 or fill out the form here to find out more about our outstanding Victoria Point retirement village.